Attributed to Benjamin Randolph, American, 1737 - 1792. Made for General John Cadwalader, American, 1742 - 1786. Carved by Hercules Courtenay, American (born England), 1744 - 1784. 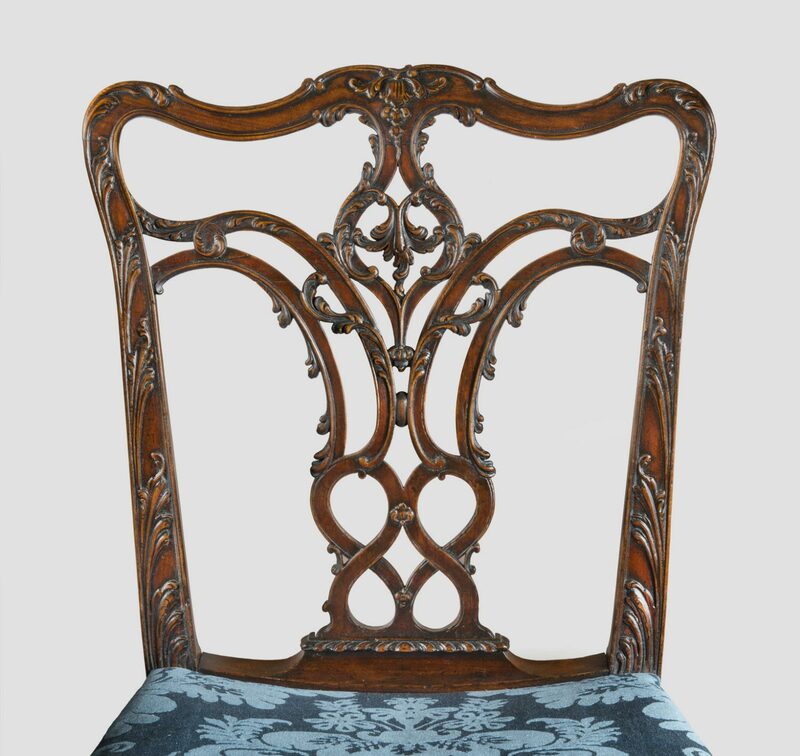 The low back, the intricate ribbon-carved splat, the saddle-shaped seat, the upholstery that extends half-over-the-rail, and the hairy paw feet on this chair distinguish it as an extraordinary design, not typical of the Philadelphia canon. 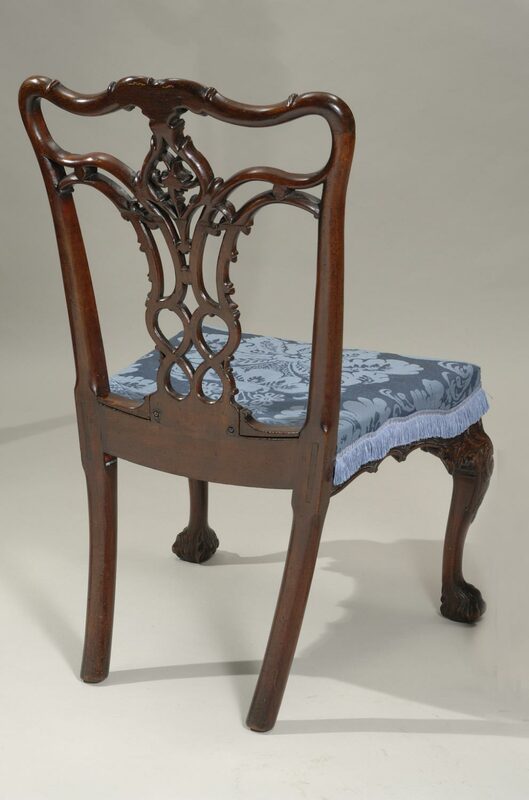 It is likely this chair was made after an English prototype inherited by the Cadwaladers from Elizabeth Cadwalader’s father, Edward Lloyd III (1711-1770) of Maryland. When not in use, the silk seat was protected by a furniture cover that tied in the back. 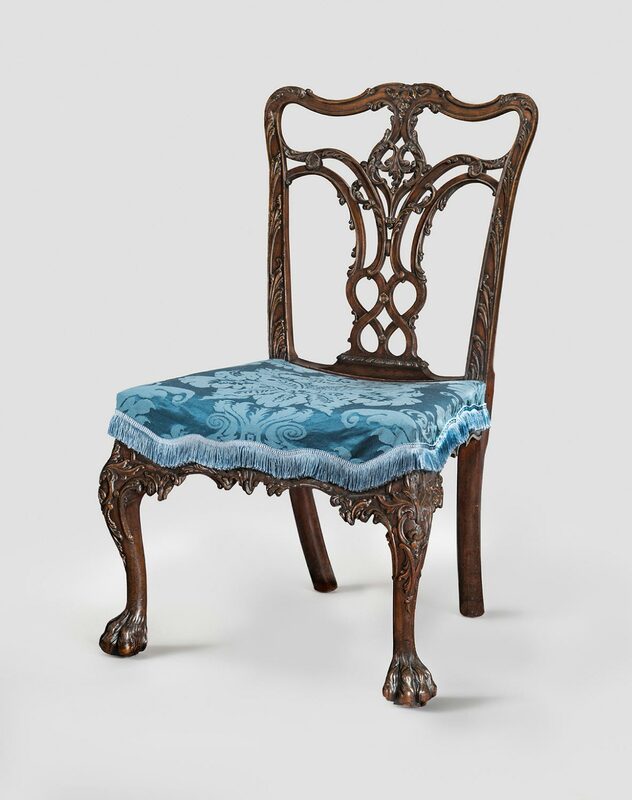 This elaborately carved side chair in the French-inspired Rococo taste is part of an extensive and important suite of ornate furnishings commissioned in 1770-71 by John Cadwalader for his new town house on Second Street in Philadelphia. Cadwalader and his wife, Elizabeth Lloyd, patronized a number of the city's leading artisans and craftsmen, who produced stylistically sophisticated forms in response to the demands of such discerning, well informed clients (see the Museum's portrait of the couple by Charles Willson Peale). Surviving invoices document that the Cadwalader suite consisted of at least thirteen chairs, a pair of "commode sophias" (serpentine-front sofas), a pair of card tables (one of which is now owned by the Museum), an easy chair, and four fire screens. Their sweeping serpentine forms, richly embellished with carved rocaille ornament, represent the zenith of Philadelphia cabinetmaking during the late eighteenth century. Jack L. Lindsey, from Philadelphia Museum of Art: Handbook of the Collections (1995), p. 260.